During a recent Voces Bolivianas blogging workshop in El Alto, Bolivia, Cristina Quisbert fielded a question from one of the group participants. The question was related to Cristina's trip abroad to attend the BlogHer Conference in Chicago, Illinois held on July 24-25, 2009. As 1 of 5 international female bloggers awarded the International Activist Scholarship to attend the event, Cristina especially encouraged the female participants of the workshop to get involved in blogging because in the Bolivian blogosphere, females are not well represented. She shared stories of how she drew inspiration from the female bloggers who shared their stories and experiences at the two-day conference. Cristina Quisbert at BlogHer Conference. Photo courtesy of Cristina Quisbert. 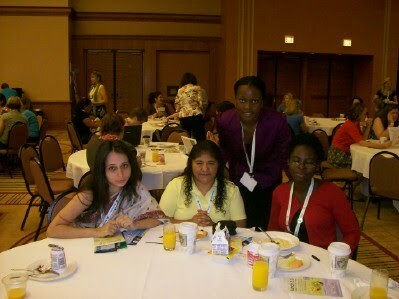 It is a month since I had the possibility to participate at BlogHer 2009 Conference that took place last July 24, 25 in Chicago and although it is a bit late I would like to share some thoughts about this event. (…) I have to say that for me, it was a complete surprise to see such a huge group of bloggers in the same place. It was my first time to attend BlogHer Conference. To be there, meant to enrich my life and my knowledge. BlogHer recently announced that is taking nominations for the next group of International Activist Scholarship winners. The 2010 Scholarship winners will receive a full 2-day conference pass to BlogHer '10, as well as round-trip airfare and accomodations. They will also present their work during a panel discussion during the conference. Nominations close on January 31, 2010. For me, each opportunity to travel is an enormous opportunity to learn. To participate in this event would not be the exception. As the program promised, there were many interesting topics. For me personally, what I liked the most was being able to hear Aymara spoken (even though it was for just a little bit), and later to hear the experience of Jaqi Aru, a group who want to “position” that indigenous language on the internet (taking into account that it is a language spoken by 43% of the Bolivian population). 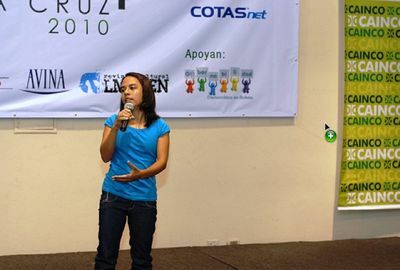 Photo of Catalina Restrepo speaking at BarCamp Santa Cruz. Photo used with permission by BarCampSCZ. 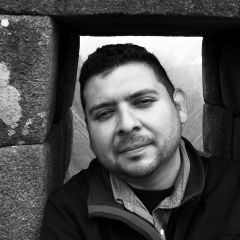 The event also featured Hugo Miranda of Voces Bolivianas and Claudio Ruiz, who leads the Creative Commons project in Chile. Qué talentosas mujeres Cristina y Catirestrepo, les deseo lo mejor a ambas, qué bello post!